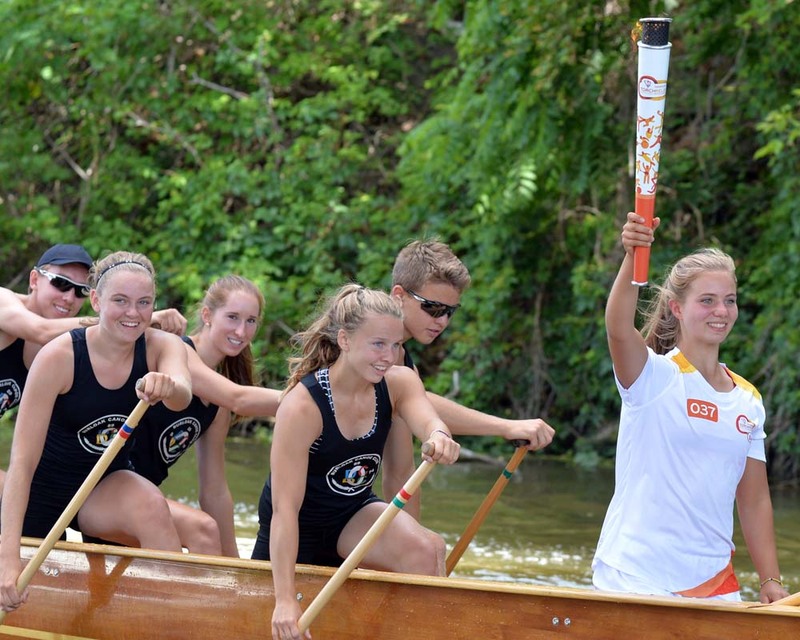 Continuing the 41-day torch relay through Oakville and Brampton, the warm up to the massive sports competition known as the 2015 Pan American and Parapan Am Games makes its way slowly around Ontario, almost as slow as traffic will be when the games come to town, unless you are travelling in one of the special games HOV lanes. Check out my post for the start of the 2015 torch relay. Lynn Petruskavich carries the smallish flame sandwiched between the security detail in the photo at top. Toronto celebrations are detailed at the bottom of this post - past the jump. 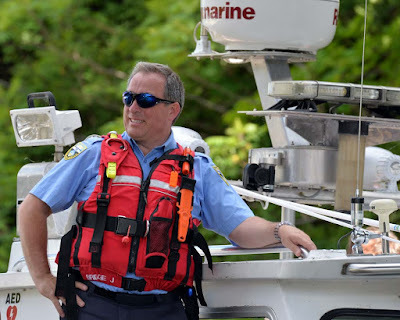 There was a massive flotilla of naval vessels using the creek's HOB lane (the Pan Am High Occupancy Boat lanes) with Camille Looper of the Burloak Canoe Club traveling from Shipyard Park to the docks of the club. 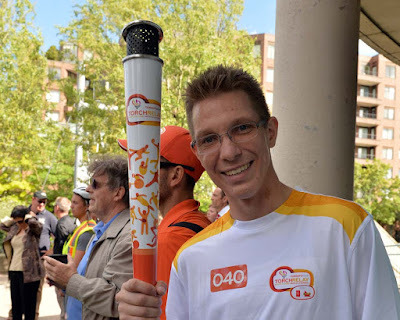 Torchbearers are given the opportunity to buy the 65 cm, 1.2 kg, $550 aluminum torch, however they will be available in the future, they don't get to keep the one they are running with. In Oakville the torch will have a canoe ride up 16 mile creek, then volunteer fitness Instructor Lynn Petruskavich will bring the torch into Centennial Square. 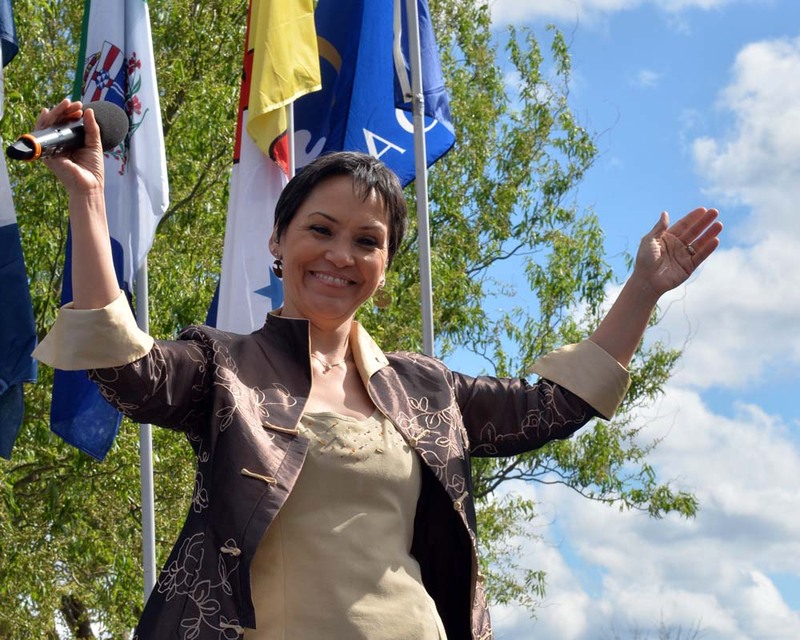 Canadian Aboriginal singer Susan Aglukark will perform along with Abbey McCay (Oakville Youth Week Tune Up winner). Later in Brampton Commonwealth Games medallist Kate Van Buskirk will finish the day's torch relay by lighting the community cauldron at 7pm. 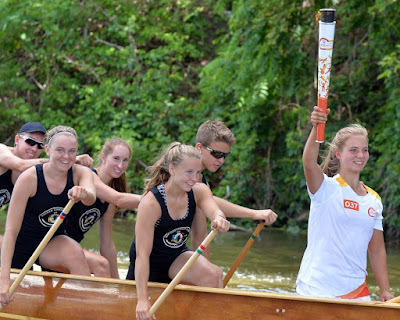 The games, officially started in 1951, will have athletes from the countries within the Americas - North, South and Central, competing every four years, one year before the Summer Olympic Games. 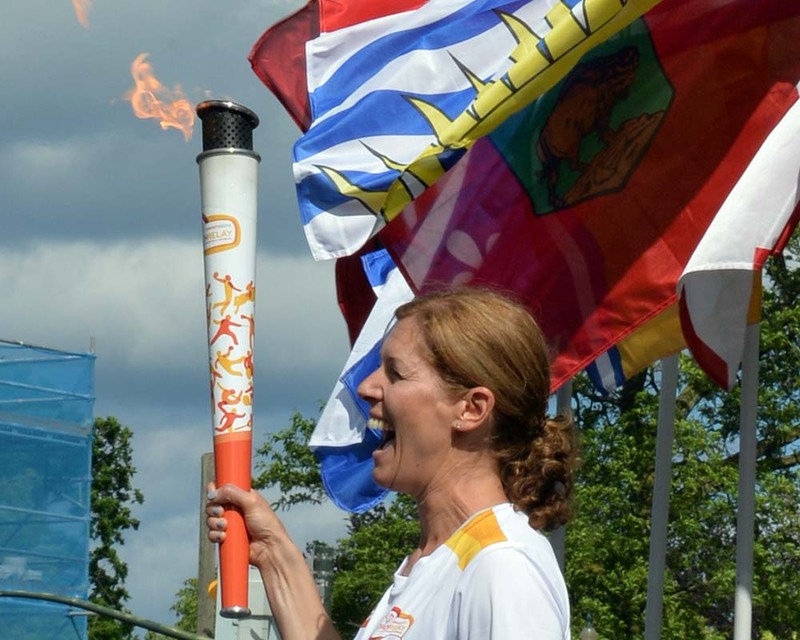 There are over 5,000 athletes take part in 36 sports in a ton of locations around the Province. 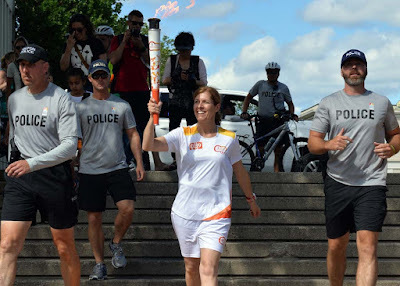 The torch relay hits 130 communities with 3,000 torchbearers after starting with a traditional ceremony in Teotihuacan, Mexico and coming to Canada on May 30 and will finish on July 10 to open the Toronto 2015 Pan Am Games. Actually more people probably see, enjoy and participate in the torch relay than the actual games - they should probably just cancel the actual games and only have the torch relay. There, saved a few billion dollars! 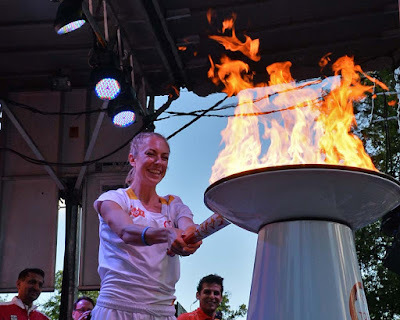 The final lengths of the Pan Am Flame run will be in Toronto from July 4-10 with five community celebrations planned, beginning at the Prince Edward Viaduct (formerly the Bloor Viaduct) and later at the Pan Am Sport Centre, the Albion Arena, Mel Lastman Square and Nathan Phillips Square. The public art installation known as the Luminous Veil will be lit in conjunction with the flame's visit at 10 p.m. Leading up to the launch of the multi-country sports extravaganza, the flame festivities are free and family-oriented with sports, sponsor activities and food trucks. 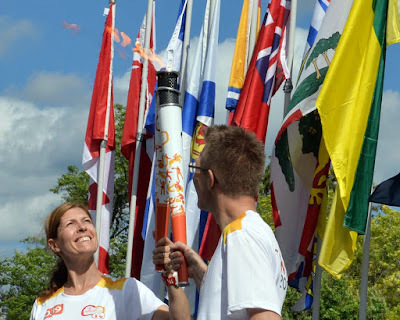 In addition to the celebrations the flame will spend seven days passing through the city and people are encouraged to come out and support the 16 torchbearers as they make their way through the local communities. • Saturday, July 4: Prince Edward Viaduct from 5 to 11 p.m (flame arrives at 7 p.m.) with entertainment by Lisa Odjig, Kobo Town, Maracatu Mar Aberto, Clay and Paper Theatre, Amélie et Les Singes Bleus and DJ Linterna. 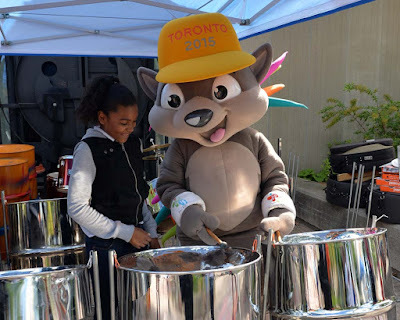 • Sunday, July 5: Toronto Pan Am Sport Centre (which will be known as the CIBC Toronto Pan Am/Parapan Am Aquatics Centre and Field House during the Games), University of Toronto Scarborough campus, noon to 4 p.m. (flame arives at 2:45 p.m.) with performances by Lisa Odjig, Maestro Fresh Wes and Henry Flow. 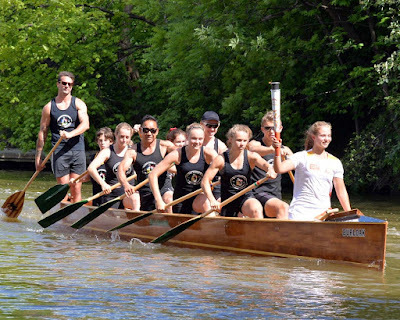 • Tuesday, July 7: Albion Arena, 5 to 9 p.m (flame arrives at 7 p.m.) with Jerry Jerome and the Cardells, Shiamak Davar, Toronto Dance Team and Parichay. 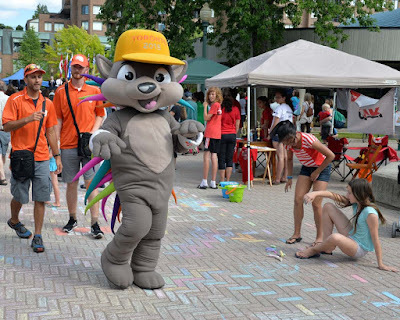 • Wednesday, July 8: Mel Lastman Square, 11 a.m. to 3 p.m (flame arrives at 12:30 p.m.) and with All Nations Juniors, Les Chiclettes and Samba Squad performing. • Thursday, July 9: Nathan Phillips Square, 5 to 9 p.m. (flame arrives at 7 p.m.). Team Canada competitors will make special appearances while entertainment will be by Maracatu Mar Aberto, TDots Finest Bboys and BGirls, Les Chiclettes, Live Art by Essencia Collective and DJ Grouch. "Each event will include the arrival of the Pan Am flame, the lighting of the community cauldron, official remarks from government and Games partners, and music and performances that highlight the Pan American culture and spirit."